Today I am proud to say I became Star Seeker. I helped pack for a mission to discover unknown stars on a quest to bring Infinite Energy to Earth. Alongside my fellow Star Seekers, each with our own sticky white name label ID, I travelled through the Solar System and beyond. We discovered a distant world covered with earth, afforested by sweets under skies, which sported clouds of coins. We encountered a large, lime alien called Aperson who spoke Blap – and a little English luckily as my Blap is lamentably poor. Still seeking we narrowly avoided being caught up in a Supernova and chatted cautiously with a peckish Black Hole. Did we succeed? You will have to go on your own mission to find out! What did most definitely succeed was luring a group of children away from the unexpected sunshine of the Easter holidays into space. United by ID labels and curiosity the three to eight year olds, and their attendant adults, immediately engaged their imaginations, skillfully led by the more experienced crewmembers Alph, Betty and Gammo. I enjoyed watching the wonder and involvement in the children’s faces as much as the show. No longer an audience they were a constellation of Star Seekers engaged on an adventure, brave and fearless, roaming deep space to rescue Earth. Their ideas flowed as freely as a Tim Peake’s spilt drink, steering the show where no show had gone before (sorry!) Aside from occasional squabbles over minding planets, they were totally involved, faces lit up and sitting on the edge of their seats enraptured – pure magic! Not just the children either, adults needed little coercion to suit up, strap in, blast off and wrestle with anti-gravity. We endured hyperdrive, created an asteroid belt (great fun) and boogied along with the youngsters. I had a huge grin on my face for most of the show delighted by the ingenuity of both the production and the children. After the show came the debrief (Q&A session). So many stayed that it actually seemed more of a continuation of the show. From the Tim Peake generation came amazing questions expertly answered by a cast who have spent three years on the show and sensibly decided early on to divide the areas of research! In an impressive full half hour of questions there were none that were dodged or fudged. 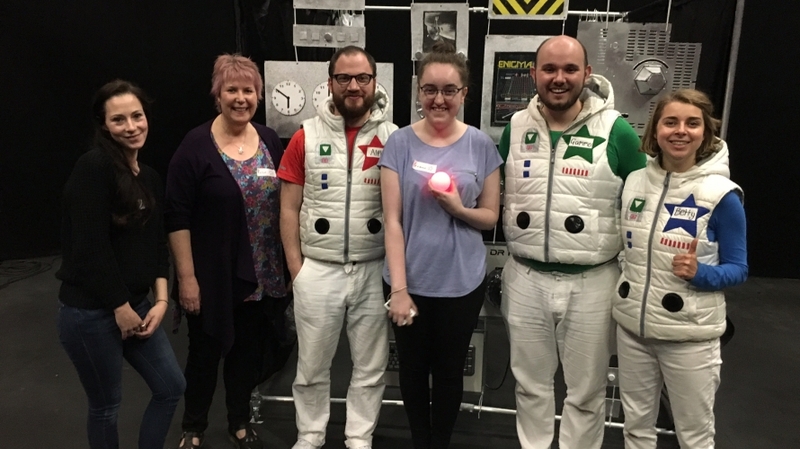 My personal favourite question was, “I know why you wear a helmet to breathe in space but why doesn’t space get in on Earth?” We were given a detailed tour of the set by Alph (Ben Vardy), Betty (Jesse Meadows), Gammo (Jack Drewry) and Director Helena Middleton. It was a thing of recycled beauty, cleverly made from “other people’s rubbish, we did ask if we could have it!” sprayed mostly silver and brilliantly thought out as I had come to expect from The Wardrobe Ensemble. Parents shuddered slightly as the Star Seekers were told they could make their own …..
As I stood blinking in the afternoon sunshine (it is quite dark in space) I pondered on how much fun had been had by all of us. I take my Spacesuit Helmet off to you Betty, Alph and Gammo, I haven’t enjoyed a Wednesday afternoon so much in aeons.